12 people in a 6 bunk hut. The weather report for the weekend indicated what looked to be quite a violent deluge of a front smothering the entire country all at once, from north to south. The met service was issuing weather warning’s galore. Forecast chart visualisations available through Jim McGregor’s metvuw.com website might have implied that all of New Zealand would be bathed under a combination of beautiful sky blues and majestic sunset reds during the weekend, but unfortunately the colouring on those charts was artificial, and in fact indicated quite the opposite. Our party was affected too, with two members pulling out late on Friday afternoon, having decided they were too frightened at the prospect of spending a whole weekend playing cards against the rest of us at Rangiwahia Hut. Location: Ruahine Forest Park, Rangiwahia Road End. People: Alistair, Sarah, Marie, Jeremy, Dirk and me. 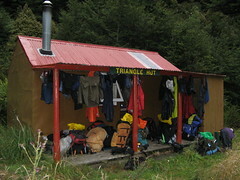 Huts visited: Rangiwahia Hut (1 night), Triangle Hut (1 night). Intended route: Up to Rangiwahia Hut on Friday night, then past point 1635 to Maungamahue. West to Te Hekenga, around to Taumataomekura, along Sawtooth Ridge to Ohuinga, then down to Pourangaki Hut for Saturday night. 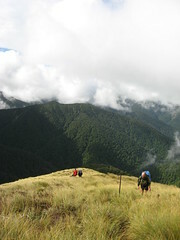 Up to Pourangaki on Sunday morning, then back along to Maungamahue, and out again via Rangiwahia Hut. Actual route: Shortened a lot due to weather and injuries, we reached Te Hekenga then followed the spur down to Triangle Hut for the night. Back up to Rangiwahia Hut via the main DOC track, and out. The previous time I’d visited the Ruahine Range, it had been extremely windy, and forecasts for this weekend were threatening something at least as bad. By some coincidence, we were even heading back to a similar part of the range, only a few kilometres south of Pourangaki and even with plans to cover some of the same region if things went well. The six of us who hadn’t abandoned the trip briefly threw around ideas of possibly going somewhere else, perhaps a place which might have been a little more sheltered from the front and less likely to be exposed to the kinds of severe winds that the Ruahines tend to attract on windy days. 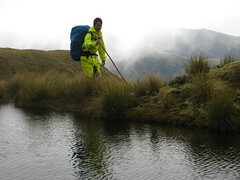 Ironically for a weekend when a severe rainfall was expected, parts of the Tararuas actually seemed like a feasible haven by comparison, simply because there was more space not on the tops which might be available for shelter. In the end however, we decided to head to the Rangiwahia road-end as planned. It was possible that we might spend the entire weekend at Rangiwahia Hut, which sits right on the bush-line, but Alistair (as the organiser) was keen to ride his hope that we might just get what he called a “window of opportunity”, if the front was polite enough to hold off for at least a few hours into Saturday. So we packed into the rental van and left at about 5.30pm on Friday night, two people less than what we’d expected an hour or two earlier. After a brief stop for dinner at Bulls, the weather was still very calm as we approached our destination. Near the Rangiwahia road-end, Alistair attempted to singlehandedly save the New Zealand bush with our 11 seater rental tank by running over a possum that had strayed out onto the road. He missed. Egged on by accusations coming from the back of the van that he was a vegetarian (one of the worst insults you could direct at Alistair), he got the second one a few minutes before we arrived at the road-end, confirmed by a good two thumps below the right-side wheels. 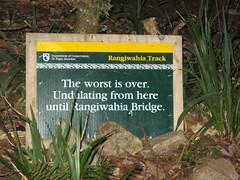 signage on the Rangiwahia Track. The people of the club’s easy-rated group, who were planning to camp there that night, were already unpacking their things. We still had a bit of walking to do, so after some quick preparations and goodbye, we were on our way at about 9.45pm, not long after Steve and Sylvia (who composed the club’s medium-rated group). 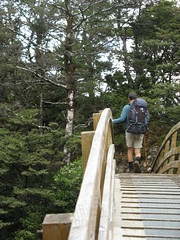 DOC labels the Rangiwahia Hut Track as a 2 – 3 hour track, but for anyone who’s reasonably fit and without much reason to stop and look at the scenery, it could probably be done in a little over an hour. We were walking it in the dark so there wasn’t much scenery to see. It took us about an hour and 20 minutes, and even that wasn’t too stressful-a-pace. (We stopped and regrouped several times on the way up.) It’s a very popular track however, and presumably attracts all levels of trampers, which would explain why DOC would be conservative about promoting the estimated time. The track is mostly even except towards the end where it starts switching up the hill a little more steeply, and where it diverts steeply to get around an active slip. The slip, which we reached about 20 minutes in from the road-end, is very large. Although the detour over the top of it is very clear and doesn’t look very dangerous if taken carefully, it does turn what would have been a 4 minute walk into a 15 minute walk (or maybe 10 minutes into 30 minutes, depending on the pace of a group). There was still no sign of the incoming weather on the way up, and without much turbulence in the upper atmosphere (according to the stability of the stars), it was beginning to look as if we might still get one of Alistair’s windows of opportunity the following day. As we looked south from near the top, the horizon was dominated by the pollutive glow of Palmerston North’s glittering night-life. We arrived at Rangiwahia Hut a little after 11pm, at roughly the same time as Steve and Sylvia. There were already a couple of people asleep in the bunks at that time, so we made an effort (perhaps not one to be ultra-proud of) to get settled into bed as quickly and quietly as possible. The final candle was out about 15 minutes after we arrived. It would have been out sooner than that except nobody had taken the responsibility of putting it out. By the time we were settled into our bunks, the blowing efforts of Steve, Alistair and myself turned out to be more comical than effective. Somebody’s cellphone alarm went off at 5.30 that morning, and I think it belonged to one of the two people sleeping in the other side of the hut. They didn’t drag themselves out of bed, though, and it worked out that we never actually met them. We began to stir ourselves out of bed about half an hour later, welcomed to the day by a nice sunrise. 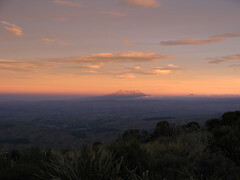 The sunrise was dominated by a red sky, suggesting the on-coming front with rainy weather, but the mountains of Tongariro National Park were clear in the distance. For now it was still calm with no sign of the predicted onslaught. We were definitely going to get to walk somewhere today, and that was a great feeling considering what everyone had been telling me before I left. 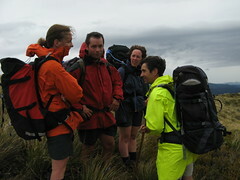 Our group left Rangiwahia Hut very shortly after 7am, heading west towards the Whanauia Range. Sawtooth Ridge, the day’s golden destination, was almost immediately visible in the distance, very clear against the backing of the rising Sun. It took about 50 minutes to get to the first clear waypoint, which was the top of the spur we were on, a couple of hundred metres north of Mangahuia. This point is also marked by a clear DOC sign which points back to Rangiwahia, on to Triangle and Pourangaki, or (towards the south) to the head of Dead Man’s Track, which is an alternative route down to the Rangiwahia road-end. at the top of Dead Man’s Track. We stopped briefly for about 10 minutes to re-group, and Alistair used the time to explain the several alternative plans he had for getting off the tops at different stages, depending on when the front came rolling in. We had possible exit points going straight down to Triangle Hut, down to Pourangaki Hut from Maungamahue, or back down to Triangle from Te Hekenga. If we got past there we’d be onto Sawtooth and would pretty much need to be confident to be able to finish it. That was all a decision for later however, and still having no sign of the incoming storm, we began our trek north-west for another 3 kilometres along the ridge towards Maungamahue. We passed the main turn-off for the poled route down a spur to Triangle Hut at roughly 8.30am, and shortly after we began to sidle around the eastern side of point 1635, stopping shortly after a tarn (which is marked on my topo map) for a rest. The scene of the curving spur towards Maungamahue from this point was impressive, so much so that I think it might have distracted me when I accidentally put my right foot into a half-metre sink-hole that was hidden beneath the grass. It hurt quite a lot at the time, but I could still stand on it and thought I’d try walking on it a little longer to see how it went. 15 minutes later though we’d stopped again, and I was strapping it up because it didn’t feel as if it was getting better quickly. It wasn’t just me having problems, either. Marie was beginning to find that she was getting unusually exhausted and falling behind, and we later decided that she might have picked up some food poisoning or something similar, possibly even from dinner the previous night. Despite these issues, the weather was still holding off and our window for walking was extending ever further. 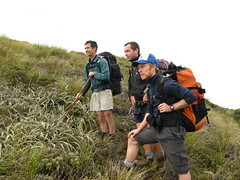 We reached the top of Maungamahue at about 9.30am, and pressed on. 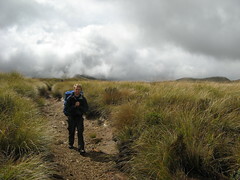 From Maungamahue we turned east again, aiming towards Te Hekenga along what was a bit of a wonky ridge. Looking back towards Ruapehu, however, it was still very visible, meaning that the weather was still some distance away. Over time I figured out that I could still walk on my ankle as long as I was careful, and that it was mostly only side-to-side movement that was having problems. During this stretch, we were able to look over to the left and see Pourangaki Hut below us, where I’d been on my previous trip into the Ruahines, and which had been one of our bail-out options for today. By 10.50am we’d made it to the saddle between point 1493 and Te Hekenga, and we stopped for a snack and a rest for a quarter of an hour. The saddle where we stopped is quite deep, and looking up towards Te Hekenga about 300 metres higher was a little daunting from the bottom. What was a little more concerning though was that half way up, we began to feel light spots of rain. Marie was really struggling by this point, being completely drained of energy from whatever bug it was she’d picked up, and the group became separated for little. Alistair, Dirk, Jeremy and myself ended up at the top a little before mid-day, while Sarah and Marie hung back and took their time. Eventually, Alistair decided to go back down the hill to give Marie a hand bringing up her pack. 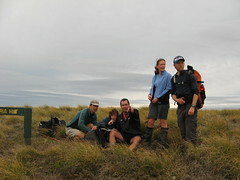 Meanwhile the remaining three of us found a sheltered spot on the southern side of Te Hekenga and grabbed a little lunch while we waited for them to return. By the time we’d regrouped just past Te Hekenga at about 12.30pm, it really looked as if it’d be a good time to finally get off the tops rather than continue around Sawtooth. The wind had come up a bit and some light rain appeared to be a precursor to what was coming. To add to things, Marie was feeling sick and my ankle was still quite uncertain. As a consequence, we divided up some of Marie’s things, which helped immensely, began the scoot over point 1523 and down to Triangle Hut. There is a track down the spur that we followed, but it gets a little lost in places. Getting to the bush-line is easy enough, and we were well into the leatherwood by 1.55pm. The track through the leatherwood is manageable enough, and there was only one small clearing in which we weren’t entirely sure where to push through next. After a short look around there were only a couple of possible options, and further investigation found the track again fairly quickly. Within a few minutes we reached taller trees and although we used a compass from time to time to ensure we stayed on the correct bearing down the spur, the track was still quite easy to pick out. The only real hindrance was patches of Bush Lawyer, which we came across in increasing amounts on the way down. From about 3.20pm, the spur started to get much steeper and less clear. It’s possible that we may have lost the best track somewhere along the line, because by now we were pushing down an area that looked increasingly as if it was turning into a bluff above the river near the hut below. When it really began to run out however, we did find it possible to bash further around to the front of the spur. Alistair and Dirk found a way straight down to the river from there, while Sarah, Marie, Jeremy and I managed to find a much more definite track that went straight down to the river, after a little hunting around. By now it was raining quite steadily, but with a couple of quick hops over the river, we were at Triangle Hut just after 3.30pm. With the six of us all trying to unpack and hang our wet clothes and gear within the limited space under the verandah of the six bunk hut, things became a bit complex. In the rush, Alistair managed to drop his spoon between the cracks in the deck, which was a real pain. Fortunately Dirk turned out to be an expert at hanging a loop on the end of a pointy stick, managing to fish it out after about ten minutes of trying. With it still being a little to early for dinner, we spent the time relaxing on the bunks, washing up in the river, and catching up on sleep. Six people fit very nicely in a six bunk hut, which is why it was marginally concerning an hour later when we heard a couple of voices approaching from the river outside. It turned out to be the first two of a group of nice happy people from the Wanganui Tramping Club, who’d walked up the river from the Heritage road-end. They were a little concerned to see us, too (albeit not in a mean way), because we quickly discovered that there were eight of them. Considering the forecast, it didn’t seem to be a good night to be outside. Although I think it’d have been possible to get 10 people over the floor of Triangle Hut in a desperate situation (17 if there were a rotation system of visits to the long drop), even getting 14 crammed into the hut was going to be cosy. They still did have one tent for a couple to sleep outside, though, and we loaned the rest some of our inflatable sleeping mattresses to go on the floor. 12 people were now in the six bunk hut, and the door and windows remained wide open that night. A first for me was that with such a crowded hut, there was no snoring. Or, at the very least, and hint of snoring was quickly overwhelmed by the sound of rain on the roof which began about 11pm, and soon after the sound of the torrent of water coming down the now flooded river outside the front door. I was on the top bunk under a clear section of the ceiling, and during the several times that I awoke through the night, I actually thought it’d stopped raining. In hindsight I no longer think it had stopped raining on the roof at all, and that I had simply been deceived by the roaring sound of the river outside, which made it difficult to hear much else. As it got lighter it was easy to look out the door and see the river not far away. It had changed completely from the trickle the previous day, and I have to admit that I was concerned we wouldn’t be able to cross it in that state. 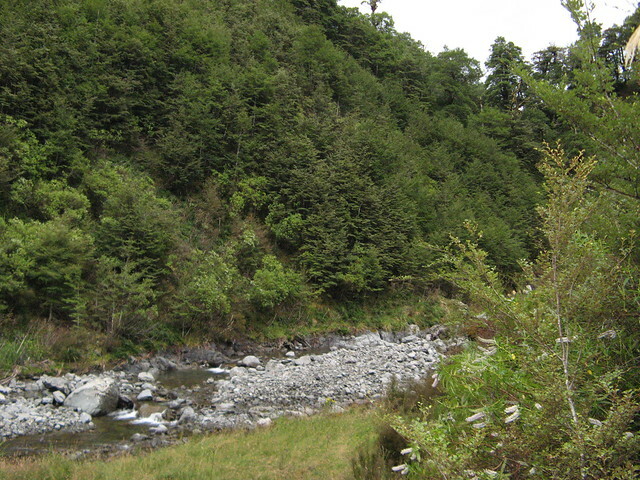 After breakfast and some further consideration, however, we ended up leaving at about 8.30am, taking Peter with us (from the Wanganui group), because having decided that walking down the river would be a bad idea, they were keen to relocate their van. I decided to leave my long johns on under my shorts for Sunday, partly because it looked like it could be cold and windy at the top, and partly because I’d accidentally put my boots and gaiters on without remembering to take them off. As there are actually two rivers which come down from separate regions, and join directly outside Triangle Hut, we were actually able to cross it in two parts. Even just the first half the river looked quite daunting in its flooded state though, and this was going to be the first time it’d actually be necessary for me to be part of a proper arm-linked river crossing since I completed a practical course about a year before. Nevertheless we went ahead and eventually got across with six of us linked, not including Dirk who had somehow snuck over on his own with his walking pole during an instant that I’d blinked. Once over the first half, we were able to walk about 30 or 40 metres back from the confluence, and get over the second half by sliding along a tree that had fallen over the width to the other side. From here it was a bash up through the trees of about 100 vertical metres, and shortly before 9am we discovered the official DOC track up the spur marked with orange triangles. The crossing itself was an interesting lesson in the multitude of different and conflicting methods that people have learned and been taught for crossing rivers over the past several decades, but I might leave that for another story because there’s a lot to it. Suffice it to say that I was very relieved to reach the other side, having worked myself into quite a nervous state beforehand for a variety of reasons, because I knew that from here we were basically home-free to the road-end by comparison. To add to my relief, my damaged ankle had by now descended to being a figment of my imagination, which was a relief. I could barely feel it hurting at all. near the top of the spur. The track from here back up to the spur was a very good track, of course. At a very relaxed pace with the entire day to cover a relatively short distance, we reached the leatherwood near the bush-line (with a good track cut through it) about 45 minutes later. The rain had now stopped, and the hills throughout the range were starting to become clear from behind the cloud. I have to admit that this is my favourite tramping weather, too. It’s quite cool but not too cold, and and the scenery with the nearby clouds wafting through the hilltops is a great thing to walk through. Jeremy was hanging back taking a lot of photographs, and after seeing some of them I can agree they came out very well. For a weekend whose forecast had begin so horrendously that a quarter of the people on our trip had elected to pull out an hour before we left, we’d had a very successful time. Dirk and his magical pole. Having made our way onto the tops properly, the track turned into a poled route back up to the main ridge, and at 10.45am we were back to the track we’d walked along the previous day, underneath point 1635. It was still noticibly windy on the tops, but at the same time it was entirely bearable — my decision to leave my long johns on that morning was certainly paying off, however. During the 20 minute walk in the direction of Mangahuia, we heard a noisy helicopter descending through the clouds. We never actually saw it, but it sounded as if it descended into the valley near Triangle Hut, and then lifted up again. We joked with some ideas about someone having gotten into trouble, but we never found out what was going on. From 11.15am having reached the signpost which points to Dead Man’s Track and Rangiwahia Hut, we turned onto the heavily walked track along the tops back towards the hut. The heavy rain overnight had caused quite a few endangered snails, of which I forget the name (although somebody told me), to emerge above to the track. Where we saw them, we picked them up and moved them to one side to reduce the chance that they might get accidentally trampled. Finally, just before midday, we reached Rangiwahia Hut, complete with its Ruapehu back-drop. Having more time to kill, we sat down for a decent lunch, with Jeremy sharing around some of his weird fruit cake that we hadn’t eaten the night before. A kind visitor to Rangiwahia had left a packet of Moro bars on the table, but not being in great need we left them for the next person to be stranded in a blizzard. Dirk on the Rangiwahia Bridge. Marie, who was still not feeling too well and was keen to get out, was the first to leave a little before 1pm, and the rest of us followed within a few minutes. 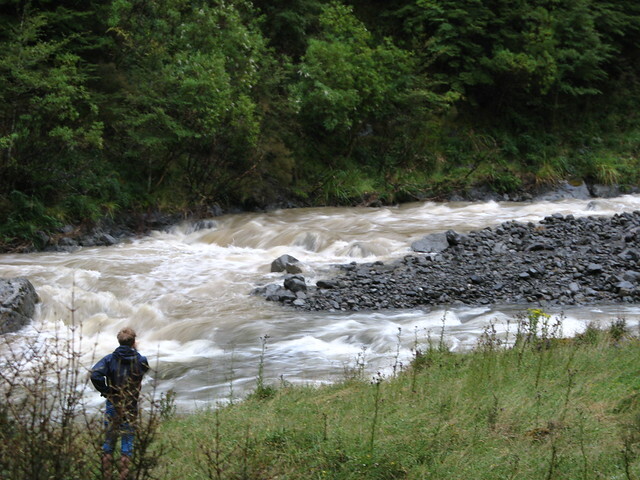 Unlike on Friday night, we now had a clear view of the massive slip that washed away part of the Rangiwahia Track. From the vantage point on the way back, Alistair noted that the detour over the top must almost get all the way up to Dead Man’s Track on the top of the ridge. Dirk, Jeremy and I finally caught up with Marie when we reached the van at the road-end, a little after 2pm, bringing a great weekend of walking to an end. Having packed things up we piled into the van, and headed back towards the Heritage road-end further south, where Peter kindly gave us a small donation towards ice creams on the way home. 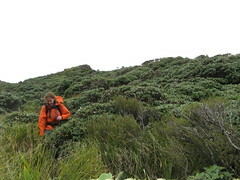 This entry was posted in tramping and tagged bagged:rangiwahia hut, bagged:triangle hut, bush lawyer, change of plans, leatherwood, navigation, ruahines, tramping, wellington tramping and mountaineering club. Bookmark the permalink.